Welcome chi to the front entrance of your home with favorable colors, shapes, and accessories like door mats. 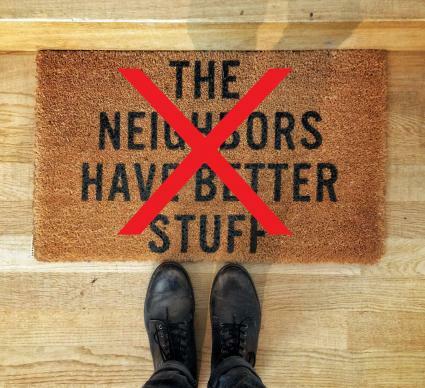 The right door mat gives a boost of positive energy every time you or a guest crosses it to enter your space. The front door - even if you don't use it as the main entrance and just duck inside through the garage - is the mouth of chi, where energy enters your home. The compass direction determines the color of the door and the color and shape of the most beneficial door mat. Find the door-facing direction and determine its feng shui element which gives you the best colors. Match or harmonize the color of a door mat with the door color, then consider shape. Always defer to aesthetics in your choice so your entry has good curb appeal and feels welcoming to you. South - Fire governs the South and fire's colors are red, purple, deep orange, vivid yellow and deep pink. The wood element also nourishes fire so you can add greens and browns to those colors. Angular shapes - triangles/stars - are Fire element's shapes. North - Water is the element in the North. Water's colors are mainly blue and black with some white and gray, and water's shape is round or wavy. West and Northwest - The metal element is in the West and Northwest. Metal's colors are white, gray, metallics and, to a lesser extent, earth colors. The shape for metal is either square or round - very symmetrical. A door mat design that features square or round shapes is also lucky. East and Southeast - The wood element is in the East and Southeast. Wood's colors are greens and browns but wood is strengthened and supported by the earth and water elements so colors could include blues, black, yellows, and shades of earth. Rectangles are wood's shape - that's classic for a door mat and easy to find. Southwest or Northeast - The earth element is in the Southwest and Northeast. Earth's colors are sandy, clay and soil shades as well as red, pink, yellow and purple - none of them pastels. The best shape for the mat is square. The Black Hat school of feng shui teaches that a black mat at the door that is about as wide as the door is a money magnet and will energize your career. Remember that if you don't replicate the pure colors and shapes of each element due to space constraints or the other colors of the house exterior, you can rely on designs on the mat and neutral mats with colored borders to boost the welcoming energy of your front door. Every subtle tweak of color and shape affects the all-important mouth of chi and your resultant good fortune. Forget cutesy sayings and monogrammed mats. No One's Home!, No Rugrats Allowed!, and Beware The Cat! are guaranteed to chase away positive chi or at least give it pause. Placing your name or initials underfoot just means people are stepping on or wiping their dirty shoes on The Smith-Jones Residence every time they visit. Why would you want that? Holiday mats should be displayed with extreme care - no kitschy or cluttered designs - and removed promptly when the holiday period ends. Faded beachy flip-flops in February or Happy Holidays! with poinsettias in July signals that you are lazy or just don't care about the all-important portal at the gate of your home. That's not a good message for guests or good fortune. No need to limit a door mat to the exterior although you may want a complementary area rug just inside the door instead of another mat. The interior follows more complex guidelines than the exterior entry because you have to balance the decor of the home with any rug or mat as well as harmonize inside and outside at the point of entry. Sensible constraints are important: any mat should be slip- and skid-proof on a polished floor; low enough to allow the door to open and close freely; and large enough so guests step fully in on the mat - not half-on, half-off some little sliver of material. The practicality of the walk-off mat is another consideration for "dressing" the entry. 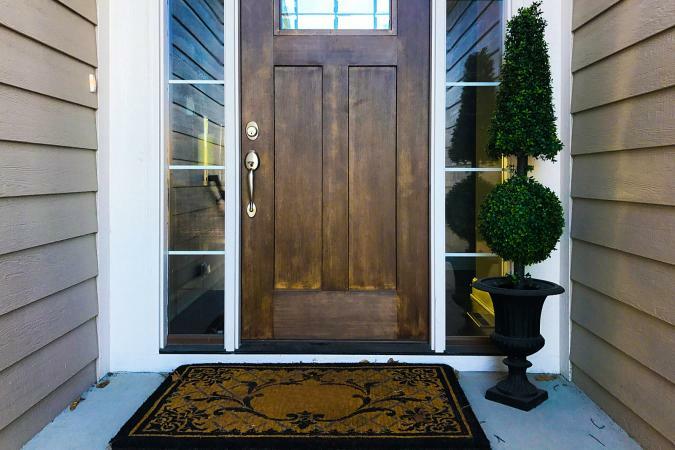 Does your front door see heavy traffic, open onto a dusty, muddy, snowy, or leafy entry pathway, or hide a delicate finished wood, clay tile, or soft stone floor? If so, a walk-off mat inside the door catches a lot of the grit and dirt that might otherwise be tracked into your home. Indoor and outdoor walk-off mats remove even more of the dirt and should be frequently cleaned for maximum effectiveness. 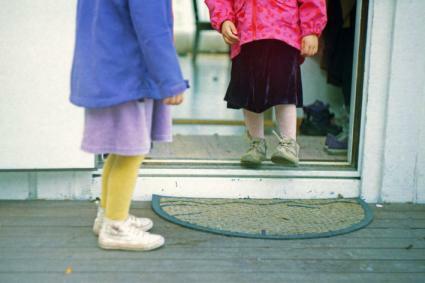 The materials used in your door mat have an effect on the swift or slow passage of chi. If you want to slow down energy before it hits your open door - from a too-straight walkway instead of a meandering path, for instance - choose a yin material. If you want that energy to barrel past a less-than-auspicious entrance - one with poison arrows like cornices or building corners pointing at the door - choose yang materials. In general, wood is neutral, but polished hardwood speeds things up and softer woods slow things down. 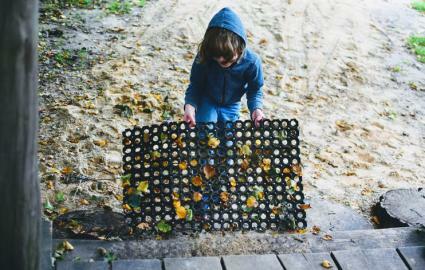 A gridded wood mat is one option. Natural fibers, like rush, cork, wicker, coir coconut fiber, and bamboo slow energy down and are best used in ideal doorways with existing good energy flow. Rubber plants symbolize abundance and wealth and rubber mats are great for wiping your feet - all good. A metal grid mat will speed up chi, and plastic tends to repel it. Paying attention to something as insignificant as a door mat signals that your dedication to optimizing your environment is unstinting and sincere. That's just good feng shui. When you select a door mat with care, you are adding to the welcoming reception you give the daily energy and the special occasion of guests. One lucky trick is to tuck red-ribbon-tied feng shui coins under the mat to attract money to your door -- three coins are okay but nine are better. It's your entry - make it work for you.